BiLevel cylinders offer affordable key control through patent protected keys. 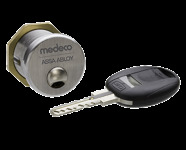 Medeco® BiLevel cylinders can tie in with other Medeco® mechanical and eCylinder products for master keying purposes. Medeco X4 is the perfect security upgrade for small format interchangeable core (SFIC) installations for Best-style systems. In addition to SFIC cylinders, Medeco X4 is also available in many other styles of retrofit cylinders and can be keyed into a single system. Medeco³ Logic offers a loss and liability solution that can be keyed into a Medeco³ mechanical system to provide the ultimate in flexibility. MedecoXT is a complete electronic locking system providing Controlled Access, Accountability, Physical Security, and System Management. More than just a way to protect your property, equipment and assets, Medeco XT is also a business tool that can lead to a substantial return on investment. Medeco Logic merges the flexibility of electronics with reliable mechanical technology - all in a retrofit cylinder. Medeco Logic offers end users audit trail, user access schedules and the ability to quickly add or remove a key electronically from a system.